Simple, comprehensive cloud-based endpoint security for workstations, laptops and servers. Seqrite Endpoint Security Cloud is a simple and comprehensive platform that lets you manage the security for multiple endpoints remotely from anywhere. Whether you’re on the move, at work or at home, Seqrite EPS Cloud ensures complete security with easy manageability. It offers a wide range of advanced features like Advanced Device Control, DLP, Web Filtering, Asset Management etc. to ensure complete security and enforce control. 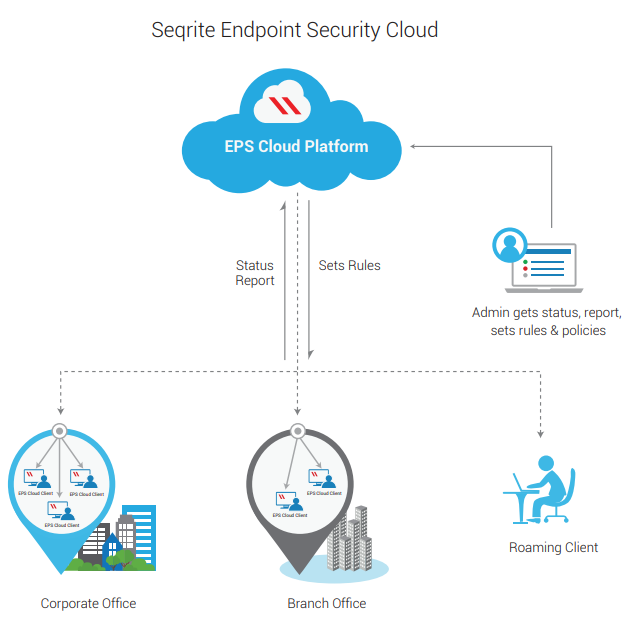 Why Seqrite Endpoint Security Cloud? Comprehensive Cloud-based Endpoint Security and Control: Seqrite Endpoint Security Cloud is a simple yet powerful platform which requires no hardware/software and can manage endpoint security directly from the cloud. It helps to enforce control over web access, data with a wide range of features such as Advanced Device Control, DLP, Asset Management, etc. Multi-layered Protection: Seqrite Endpoint Security is certified by various industry certifications and integrates innovative technologies like Advanced DNA Scan, Behaviour Detection, Anti Ransomware to protect your system from malware and advanced threats at different levels. Less Technical Expertise to Manage Endpoint Security Solution: It does not need a dedicated technical staff to manage the security solution. It is hosted on cloud and gets upgraded automatically requiring no resource involvement and technical expertise. It provides faster delivery of product upgrades which automatically gets rolled out to endpoints. Centralized Management and Control: User-friendly interface for monitoring, configuring and managing systems in the network with detailed report and graphical dashboard. entries to improve performance of endpoints. unauthorized applications within the network.